Look familiar? 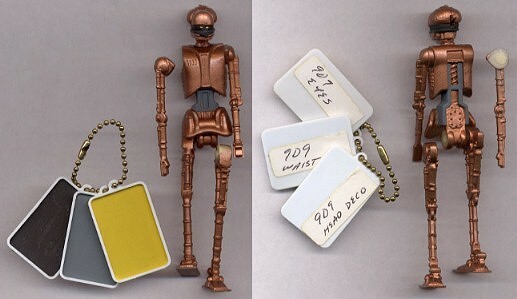 A metallic-colored EV-9d9 much like this one was used in quite a few promotional and packaging photos for Kenner's 1985 Power of the Force line of action figures. The figure that was actually released, however, was cast in a much duller, reddish-orange hue of plastic. This figure is what is referred to as a "paint master." It comes with colored plastic swatches, each of which refers to a different color of paint that was to be applied to the production figure: the charcoal color was to be used on the head, the gray on the mid-section, and the yellow on the eyes. The actual reddish color of the figure is not identified by a swatch because the figure was not intended to be painted this color once production was underway; instead, it was molded in that particular color of plastic. Of course, the prototype itself is not cast in the correct color; it is actually molded in a white color, with the metallic finish being painted over the plastic. Although many paint masters are hardcopies, this particular example is what is known as an internal first shot. It was likely made within Kenner for specific use as a paint master. For this reason, the figure lacks some of the production details, such as the movable mouth.